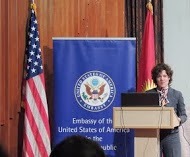 Jennifer Uhler is a Regional English Language Officer (RELO) for the U.S. Department of State. 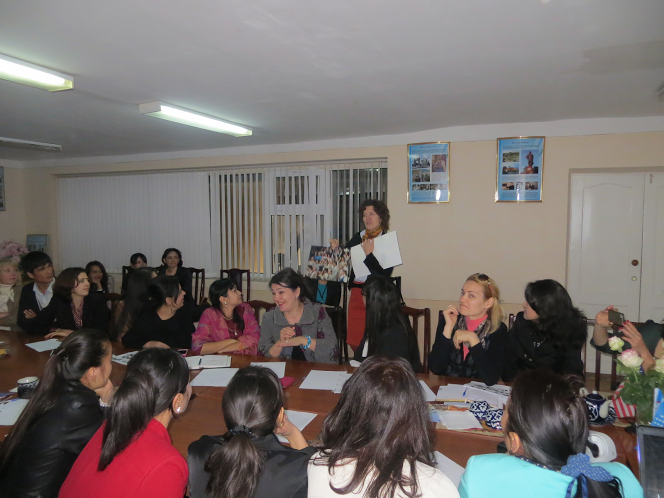 The RELO, part of the Public Affairs section of the United States Embassy in Astana, supports public diplomacy outreach through English language teaching and training in the five Central Asian countries: Kazakhstan, Kyrgyzstan, Uzbekistan, Turkmenistan, and Tajikistan. What cultural differences have you found between Central Asia and North America? Was there anything that surprised you? There are probably a million differences that I could comment on—and nearly as many similarities! Sense of time, spatial awareness, food preferences… most surprising to me is the treatment of the guest. Central Asians are known for being generous hosts, and it is true. When you visit someone’s home, they ply you with food and do everything humanly possible to be sure that you are comfortable. I’ve been entertained with songs and stories, regaled with toasts, and eaten some really exotic foods. The most exotic guest story involved being served the head of a sheep as a special guest. The oldest person at the table is given the honor of carving the head and symbolically giving each guest a special piece. I received an eyeball, indicating my position as a supervisor and decision-maker. The host who offered me this delicacy recognized my reticence but offered a glass of fermented horse milk to wash it down! You had to learn Russian for your current job, and you’ve studied several other languages. Do you have any advice for other adult foreign language learners? There is no secret recipe for learning a foreign language, as I am sure you and your readers are aware. It requires a lot of hard work and skills that most adults don’t frequently use, such as memorization and repetitive practice. Those kinds of language and mental exercises are easier to do when you are in school and used to working at learning. Adult language learning is so humbling as you stumble and suffer to express complicated thoughts in simple language. However, I find the learning experience is worthwhile when I can finally communicate a message or understand a written text or dialogue. The feeling of working my brain in a different language helps me empathize with learners and gives me a sense of accomplishment (and appreciation for the facility of my native tongue). My advice, in short, is to be plucky. Try lots of different ways to learn – classes, websites, language partners, books – and don’t give up when it seems difficult. Language learning is difficult, no matter how talented you are, and language learning takes time. How did you get your current job? What kind of training and background did you have? I saw the opening on a U.S. government portal. I'd had previous experience with RELOs when I was an English Language Fellow and had a positive impression of the kinds of work done on English teaching by the U.S. Department of State. The job combined English language teaching, professional development, language program administration, and international work – a combination that matched my background and interests. I have an MA in TESOL and Language Program Administration, and taught overseas and in the U.S. at the primary, secondary, and tertiary levels. In addition, I've developed curricula, taught graduate level courses, organized events, and served on associations. I think that these varied experiences strengthened my application and, now that I am a RELO, the breadth of my work history helps immensely in my day-to-day work with teachers, administrators, and policy makers. What advice would you give to someone who’d like to teach in one of the Central Asian countries? This could fill a whole blog post in itself. In short, take some time to get to know the region and investigate where you would like to teach, both in terms of the institution and the place. Going through an international company or program has definite benefits as working with the bureaucracy is really difficult as an outsider. You should also be sure to know the visa rules and regulations for work as these can be rather tricky and hard to maneuver. The region is full of gorgeous landscapes and teachers and learners eager to know English. All countries have national policies of multilingualism and there is an insatiable thirst for English. If you go into working in Central Asia with an adventurous spirit and a good heart, you will not be disappointed. You will be loved – and you will find yourself in love with the people you meet here. What does “mindful teaching” mean to you? Do you have a mindfulness practice, and if so, how does it help you in your work? For me, mindful teaching is connected to reflective practice. It means more than logging in my hours or pulling together and facilitating a workshop or class. Mindful teaching includes taking time to think about my audience and content before, during, and after teaching. One way I help to focus my energy is by constantly taking notes. During meetings, while observing teachers, in my office, and after an event, I am constantly scribbling into a notebook. This helps me keep my mind on the moment and leaves a record for me to come back to. I enjoy rereading my notebooks, almost like a journal, and sometimes using those notes to compose more thoughtful notes to other teachers. I find that I am able to work through issues by writing and this note-taking habit of mine helps me be more mindful.